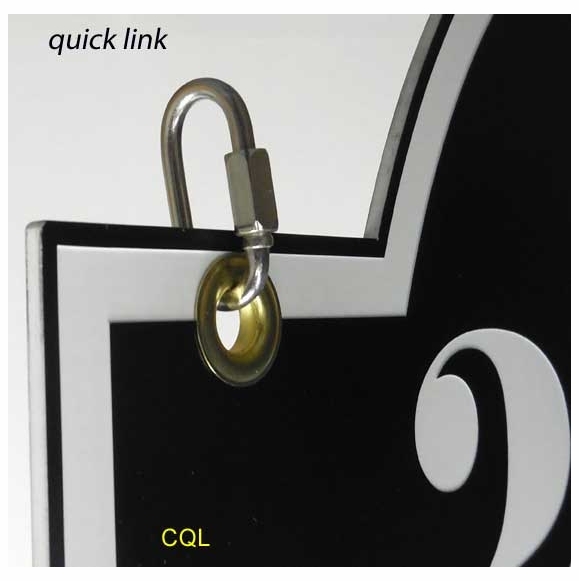 Quick Link Hanging Sign Hardware - - sold by the pair. Every hanging sign needs a secure, non rusting link of some kind to go between the sign and the screw eye, chain, or sign post loop. One excellent option is Quick Link hardware, which has a threaded lock nut to firmly secure your sign onto your sign post rings or chain. Sold by the pair. Dimensions (approximate): 1.25" long; 5/32" diameter wire; 7/16" wide inside. See Related Products for another hanging sign hardware option and a large assortment of hanging signs.